Pennsylvanian Quaker Anthony Benezet was one of the most important and prolific abolitionists of the eighteenth century. The first to combine religious and philosophical arguments with extensive documentation of the slave trade based on eyewitness reports from Africa and the colonies, Benezet's antislavery writings served as foundational texts for activists on both sides of the Atlantic. In England, those who incorporated his work into their own writings included Granville Sharp, John Wesley, Thomas Clarkson, and William Dillwyn, while Benjamin Franklin, Benjamin Rush, David Cooper, James Forten, Absalom Jones, and Richard Allen drew inspiration from his essays in America. Despite Benezet's pervasive influence during his lifetime, David L. Crosby's annotated edition represents the first time Benezet's antislavery works are available in one book. In addition to assembling Benezet's canon, Crosby chronicles the development of Benezet's antislavery philosophy and places the aboli-tionist's writing in historical context. Each work is preceded by an editor's note that describes the circumstances surrounding its original publication and the significance of the selection. 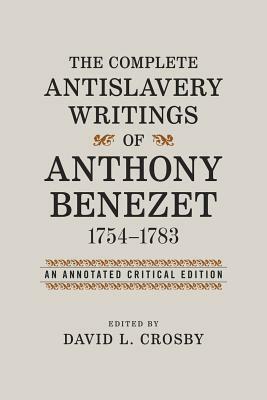 A valuable tool for scholars and students of African American history, slavery studies, and the Revolutionary era, The Complete Antislavery Writings of Anthony Benezet, 1754--1783 demonstrates the prevailing impact of the foremost pioneer in American abolitionism. DAVID L. CROSBY is emeritus professor of English and communications at Alcorn State University.